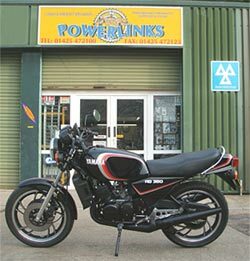 Come to Powerlinks to source parts and spares for most makes of motobike at our unit in Ringwood in Hampshire. If the part you need is not in stock we'll do our best to obtain it for you as quickly as possible at a competitive price. If you're unsure of the best part for your bike we'll advise you according to your requirements - our advice is always free! Parts and spares can be purchased at our unit on the Hightown Industrial Estate. As well as stocking a wide range of parts we can service and MOT your Triumph or Japanese brand motorcycles including Honda, Suzuki, Kawasaki or Yamaha.